This step is critical for proper cooling ! Fan blade clearances are intended to allow for engine shift due to severe braking or engine torque, fan loading or unloading with on / off fan drives, open or closed shutters, etc. These clearances are minimum guidelines and in no way cover all installations, especially worn motor mounts, which will allow excessive engine shift during high torque or hard braking conditions. Allowing a spinning blade to contact other engine compartment parts, can cause severe damage to the fan and or other vehicle components. Fans should not operate with blade tips that overlap the sides or the radiator or radiator tanks. Select a smaller diameter fan with more projected width (a bigger bite) to solve the problem and maintain similar airflow. 1" minimum from the leading edge of the fan to the radiator core or closest obstruction. (Not always the radiator fin surface). 1/2" minimum from the trailing edge of the fan to the pulleys and belts. Ensure proper clearances 3/4" from outer edge of the fan blade to the shroud (not always the fan shroud). 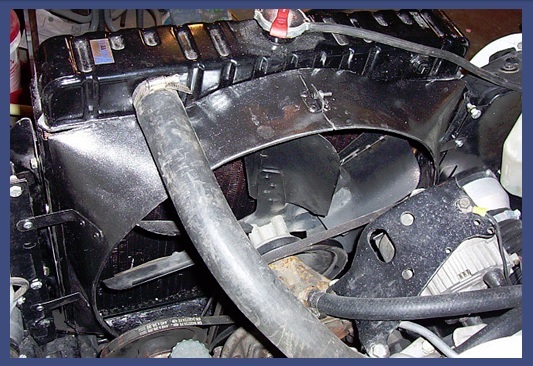 (With less clearance, engine movement could result in fan hitting shroud; more clearance results in lower efficiency). You may need special spacers to position the belt-driven fan properly. 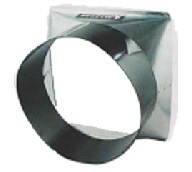 Multiple spacers may be used, up to a maximum of 3". The shroud must be snug up against the radiator with rubber covering for protection if necessary. Air will take the path of least resistance therefore following these instructions will force it through the radiator. Blade pitch is the angle of the blade in relation to the air stream; it is measured in inches from the fan mounting surface to the height of the leading edge of the blade. Increases in blade pitch are effective in improving airflow at a given rpm but excessive pitch angles create some concern about vibration. The job of the fan shroud is to make the fan pull all its air through the radiator core. Mechanical fans without shrouds tend to pull almost as much air from around the fan blade tips as they do through the core. With the shroud form fitted to the radiator and wrapped closely around the fan blade, efficiency is increased greatly. The fan ideally should fit one half of the pitch depth of the blade into the shroud opening. If it is too far rearward out of the shroud air will be pulled from around the blade tips. Being too deep into the shroud can cause turbulence affecting airflow and cooling ability. Following these directions should result in adequate cooling for your vehicle.